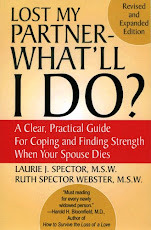 LOST MY PARTNER blog: when will this be over? part 1: how long will i be in mourning? It was a year ago 1/20/12 that I lost my husband. He knew that he was dying and tried to prepare me for his passing, but that didn't help. Although, I know he is in a better place, no longer in pain etc. I miss him so terribly. He was my best and dearest friend and we were so close for over 44yrs that I can't seem to move on.